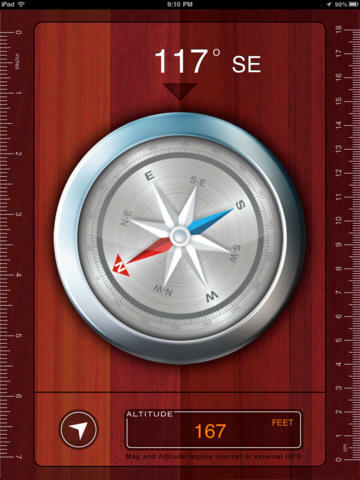 Huge Full screen Compass, plus 1 Click GPS Map with Altitude and Speed! Upgraded for the Retina display of the New iPad! New Features! 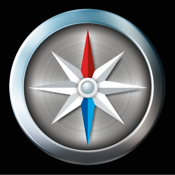 Brand new Compass choice, toggle between compass screens by touching the compass center, also now you can save and backtrack to any location on the map view. Bigger IS better! The biggest, most accurate iPad Compass! Easy to read Analog Compass with a huge Digital readout as well. You will not have the look closely to see this compass! Very high quality screen graphics, easy to read and classic design at the same time. Also includes Altitude in feet, Speed in MPH, plus a 2 sided handy Ruler! in both metric and inches. Press the button on the left lower screen for a full color map view, the blue dot is your current location. You can then click on the icon to go back to the Compass view. Automatic detection of magnetic interference. Note: Map view requires Wi-Fi or 3G connection for map data. Altitude and speed data require an internal or external GPS.